Website redesigns are a huge risk. You can throw away years of incremental gains in UX and site performance—unless you have a battle-tested process. But what does that process look like? And how do you know if your team—or the one you’ve hired—is focusing on the most important things? Many areas yield minor improvements, but to make a real difference, and protect past progress, you need a repeatable, evidence-based approach. I’m going to walk you step-by-step through our company’s UX research process for site redesigns—the role of each aspect, how long each should take, and what, generally, each entails. Create a foundation for an internal research process. Improve the vendor evaluation process. Hold your current vendor accountable. As noted at the outset, full-scale site redesigns have the potential to backfire. A high-level stakeholder can overrule research-based decisions, designers can clash with optimizers, and the bevy of simultaneous changes can make it impossible to identify which changes are to blame if a redesign performs worse than its predecessor. A “radical redesign” contrasts with a process of ongoing experimentation. That incremental approach makes it easier to isolate the impact of individual changes and avoid the risk of a total redesign. It also avoids a years-long fallow period between redesigns when competitors may continue to move ahead. Major company changes. A significant shift in your brand or product may justify a new look and feel for your site. Hitting the local maxima. 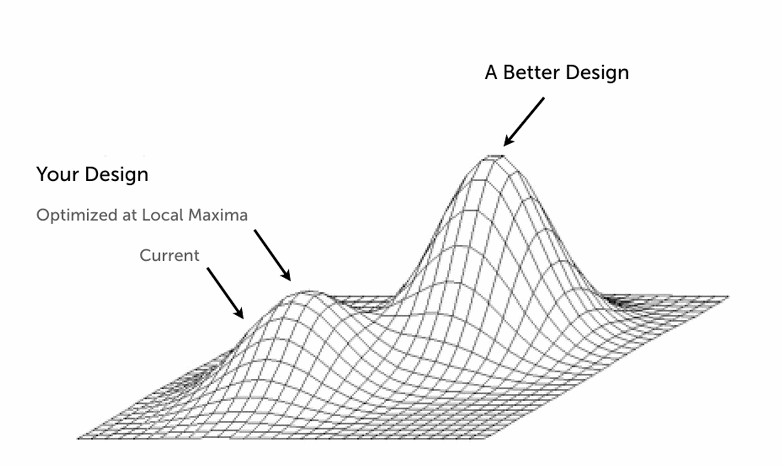 If experimentation begins to show diminishing returns, a radical redesign can raise the ceiling for site performance. Low traffic. 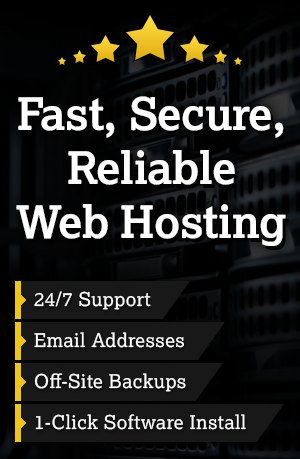 Sites with limited traffic may be unable to test changes in a reasonable amount of time. If a full-scale redesign is the right choice, the process starts with a comprehensive research plan that includes both generative and evaluative research. While there are several categories of user research, the most important breakdown is between generative and evaluative research. Generative research helps you understand your user’s world, learn more about their challenges, and generate ideas for your new website design. These techniques—such as stakeholder and user interviews, which I cover below—are mostly qualitative because the best audience insights surface during conversation and observation. When you’re building your research plan, put generative techniques at the beginning. That way, the research will define the direction of your design. Evaluative research validates how well your redesign solves the problems that inspired the redesign. Evaluative methods are quantitative—numbers measure the effectiveness the redesign. Don’t rush through the generative techniques. It’s natural to want to move quickly, get something designed, and test the design. But if you conduct only evaluative research, you’re just testing your ideas instead of building a website based on what users want. The best results, as the example below from HubSpot shows, come from combining both methods. A prime example of how to combine research methods is HubSpot’s redesigned homepage. This page alone pulls in more than 4 million visits a month, so the stakes for the redesign were pretty high. Here’s how HubSpot’s homepage looked before the redesign. The dual call-to-action is difficult to read against the blurred background. Because HubSpot had so much traffic, they had a treasure trove of data. 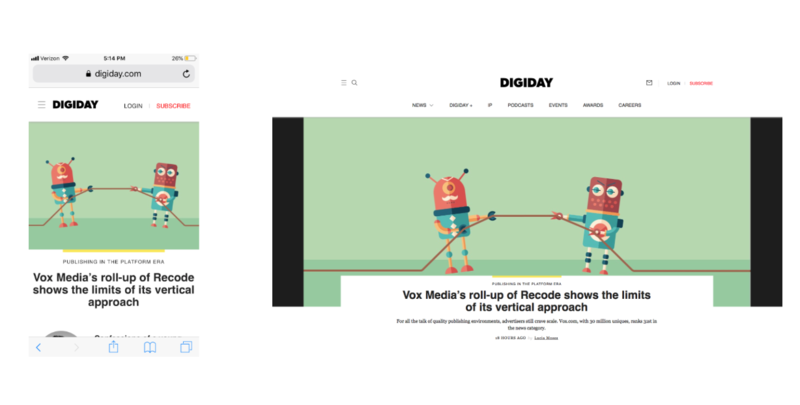 The design team identified patterns in how people navigated the homepage. Using a combination of Google Analytics, heat mapping, and session recordings, they uncovered three recurring patterns related to FAQs, pricing, and product information. But they didn’t settle for quantitative data: HubSpot’s team wanted to hear directly from their users—particularly different personas. The design team interviewed customers and stakeholders, even gathering intel from tweets, support calls, and other qualitative sources. 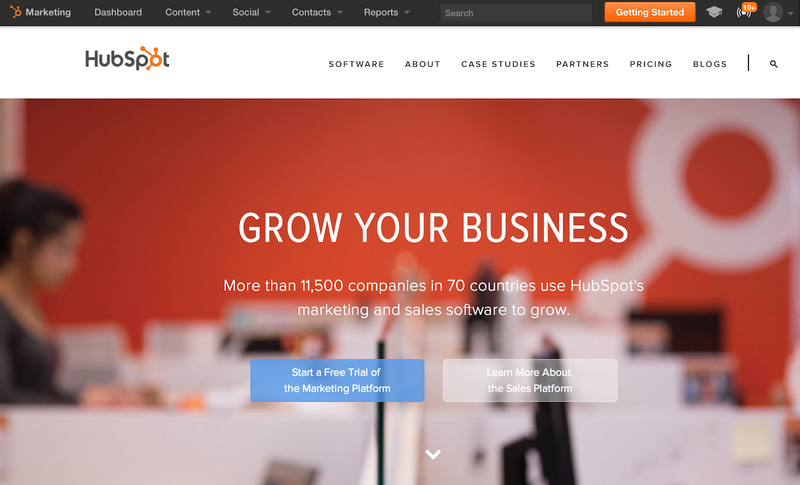 Here’s HubSpot’s new homepage after the UX redesign process. Notice the increased usability of the text as well as the single CTA. 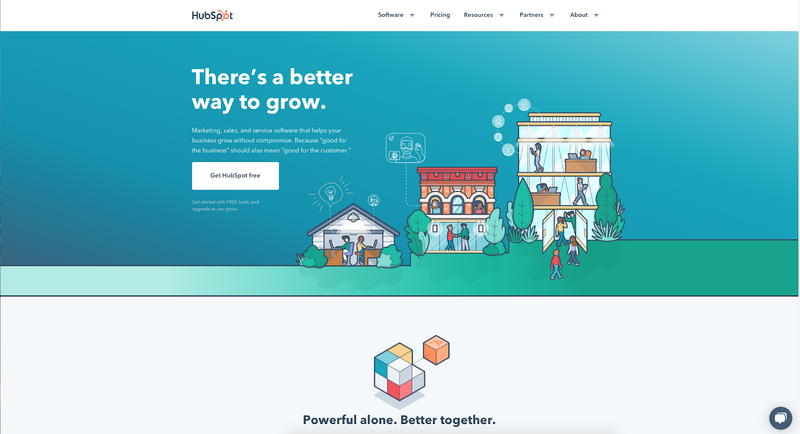 In the end, their research informed a new homepage design that boosted KPIs for HubSpot’s marketing team—specifically, increased engagement with high-value CTAs and more free-trial signups. Without the quantitative research, designers wouldn’t have been able to identify the three main behavior patterns for FAQ, pricing, and product information sections of the site. The qualitative research led the design team to deliver dynamic content based on visitor personas from logged-in users. 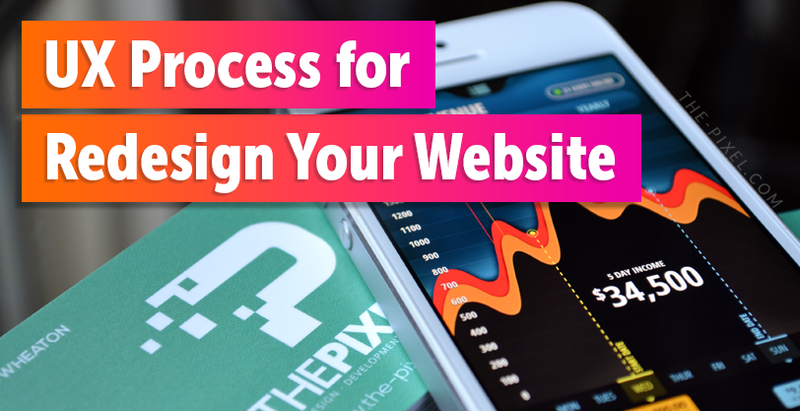 Which methods should you use to redesign your website? And in what order? Every project is different, so the process needs to be flexible, but there are fundamental steps that apply to almost any web design project. Before you do any research, however, you need to build the business case. Whether it’s convincing your CEO they don’t know everything about their users or just securing enough budget for research, these conversations can be difficult. Involve all the primary stakeholders in your company. Most objections to user research can be overcome by pointing out a simple truth: Making changes to the design later in the process—when development resources are involved—is very, very expensive. Conducting user research early and often mitigates that risk. It also ensures that the functions in your redesign are what your customers want. Here’s how we do it at DePalma. When should you do it? 1–2 months before the new redesign goes live (depending on the project scope). How long does it take? 2–3 days. This initial phase gathers internal perspectives, catalogs existing content, and includes a heuristic evaluation of the current site. Provide context about research that’s already been done inside your organization. Uncover what each stakeholder values most about your project. Ensure stakeholders understand the value of your research. Business. Marketing, product, sales, and operations. Engineering. Development and IT leaders. Design. UX, UI, and graphic designers who will contribute to the project. 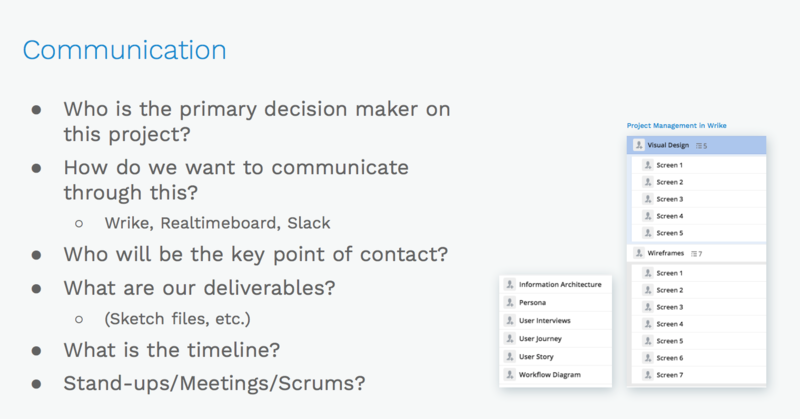 Schedule one-hour meetings with leaders in each category. The goal of each interview is to understand the project from the stakeholder’s perspective and identify how they define success. Why are you doing a redesign at all? Make sure your understanding is shared by stakeholders. Who are the users? Your site can’t be user-centered if you don’t know who your users are. Because stakeholders are not users, they often have an incomplete perspective about what users need. However, getting stakeholders’ perspectives can broaden your understanding of the market and identify patterns among users. How will success be defined? Uncover what each stakeholder imagines success will look like. Is it higher usability metrics, like task completion and conversions, or something beyond analytics, like revenue? What has already been decided? Every project has constraints; you need to uncover what’s beyond your control. For example, what is the deadline for the website launch? What technology will be used to build it? How many developers will work on the project? The actual questions can be quite lengthy, so I won’t list them all here, but there are multiple resources, like this one or this one, that dive into the specifics. Like the previous step, a content audit is about discovery: You need to understand what already exists on your current website before you can plan a new design. A content audit builds a masterlist of all your content and may also uncover previously unknown relationships between content types. The main idea is to build a series of increasingly specific silos for your content. 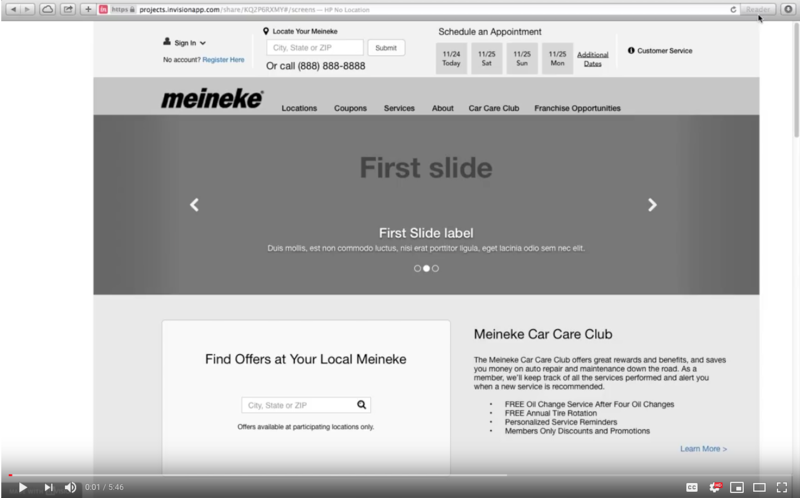 Start with the navigation at the top of your homepage. Evaluate the type of content under each navigation item. Are there topics that merit a new subgrouping? That’s your next level of classification. Repeat that exercise until you’re down to the specific page titles. Once there, you’ve more or less reached the maximum level of detail. We started with the navigation and worked our way down to individual pages. You can get more specific, but you also run the risk of diminishing returns. If your website has thousands of pages—or want to be exhaustive—you can also use a tool like Screaming Frog to crawl your entire site and enumerate all of the pages. This method will also keep you from missing pages that aren’t in your navigation. There are many heuristic frameworks (several of which overlap with conversion optimization). At DePalma, we typically follow some variation of Jakob Nielsen’s model and focus on four areas of heuristic evaluation: recognition, minimalist design, consistency, and user control. 1. Recognition. Instead of having to recall past information—like what an icon means—users should be able to recognize the context of each element. For example, the icons in Inc.com’s top nav are easily recognizable for their readers: a magnifying glass refers to the search bar, the human figure leads to a profile page, and the hamburger menu brings up more navigation options. Relying on recognition helps reduce cognitive load—people have to think less when using your site, which makes the user experience easy and enjoyable. 2. Minimalist Design. Major applications are moving toward a minimal, content-focused design, but many businesses still have flashy—and confusing—websites. Research finds that people prefer simple and easy experiences. 4. User Control. Users need autonomy to navigate your site and control their experience. People should be able to visit relevant sections of your site without unnecessary barriers, and they should be able to backtrack in the middle of any given process, like an ecommerce checkout. What else you need to consider when creating an ecommerces website. When should you do it? At least 4 weeks before your website launches. How long does it take? Gathering and analyzing the research typically takes a week. If you’re traveling to interview customers, allot a few extra days. The bracklaying phase focuses on research with your target audience—the people who actually use your website. The following techniques help you learn about your customers’ goals, challenges, motivations, and the context in which they use your website. The more complete the picture of your customers, the better equipped you’ll be to design a website that’s tailor made for them. 1. Lifestyle/introductory questions. These questions ask participants about their lifestyle and preferences to build rapport. What are some of your favorite websites and mobile apps? What is your opinion about [your product’s industry]? User interviews are the bread and butter of generative research. Talking to your customers in an interview setting yields rich insights about how they interact with your website and how your redesign can improve it. Face-to-face interviews put people at ease and help you pick up on the subtext of an answer that would otherwise get lost on a phone call or live video. To get the most out of your interviews, you need a good script. Your script should include which questions you’re going to ask, the order in which you’re going to ask them, and what you expect to learn from each question. 2. Industry/website-specific questions. These questions focus on the challenges and goals your customers have when using your website, or a website like yours. How do you currently do [main action related to your website]? Tell me about the last time you [completed an action related to your site]. What did you find frustrating about that experience? Whenever possible, encourage storytelling. Stories are the goldmines of user research, and if you can get a customer to recall a particularly important moment, their memory will be better and their answers more specific. 3. User experience questions. These questions unearth ideas on how to improve specific parts of your website. Ask them immediately after someone interacts with your website. How could the website improve? After you complete your interviews, ask yourself: Do answers contain consistent patterns? Does each interview contain tons of new information? If new information keeps bubbling to the surface, recruit more participants until their answers have established patterns. Set a maximum of 15 user interviews. At that point, you’ll have what you need. As a research technique, personas have lost a bit of their luster. Irrelevant data, half-assed research, and poor application can turn a perfectly useful research tool into a target of derision. We still rely heavily on personas in our process, but we augment the quantitative aspects with qualitative inputs. Quantitative data only makes up a small portion of our personas. The majority of our persona work focuses on goals, frustrations, rational needs, and emotional needs. This information comes from the interview process and can be synthesized to create personas that give you a detailed, in-depth view of the challenges each audience segment faces when they use your website. Understanding someone’s frustrations can directly influence your design decisions. For example, if Daniel Howell, our CEO pictured above, is frustrated by a lack of information about your service, then it’s probably a good idea to design an FAQ page or service-page widget he can expand for more information. You won’t get those insights by knowing how old he is or how much money he makes. A use case is a step-by-step description of how users complete specific goals on your website. Because a redesign attempts to solve a known issue, a use case can develop an optimized workflow that should make the experience easier—and increase the conversion rate. Based on interviews, what did people find frustrating about your site? Use that feedback to identify redundant or confusing steps in the process and cut them out of your use case. Usability.gov has an excellent example of this technique. The use case walks us through each step the housekeeper takes to complete the goal. Laundry may seem like a far-fetched example, but the premise is exactly the same for your website. Plotting the course each of your personas takes to the proverbial finish line is a powerful technique. Of course, it’s impossible to predict every path users will take to achieve their goals. Unlike doing laundry, navigating a website offers people myriad choices, and people often use your website in ways you don’t expect. Because a use case represents an optimized pattern of behavior, you can account for non-linear (and sometimes inefficient) user flows with the user control heuristic. As long as a it’s obvious how to move forward or backward, your website will maintain a high degree of usability. Once you’ve conducted your initial research, you can translate that knowledge into wireframes to conduct usability tests on the proposed redesign. When should you do it? Your first usability test should take place 2 weeks before the website goes live, but that timeline depends on how long you allot for development. How long does it take? 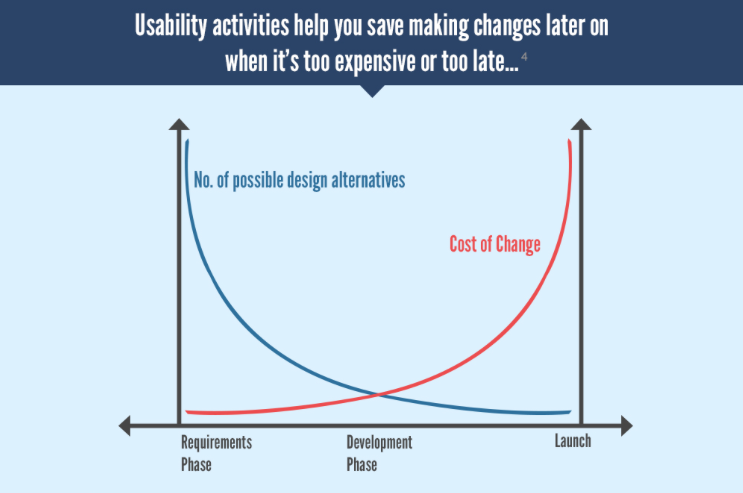 Usability testing only takes 2–3 days in the design phase, but it should continue after the website goes live. Usability testing puts research to work: Everything you’ve learned during the first two phases informs the choices you make in the development of an initial wireframe and clickable prototype. Subsequent rounds of review and testing, in turn, offer both generative and evaluative feedback to refine your design. First, we create low-fidelity wireframes. Then, we show these wireframes to users and stakeholders and make changes based on their feedback. Eventually, the low-fidelity wireframes become a clickable prototype, which is what we use for usability testing. The process of wireframing and prototyping is outside the scope of this article—those are design methods, not research—but I mention them because they’re necessary for usability testing, which is the standard for evaluative research. You can do usability testing in person or remotely. Unless it’s a very complex site, remote usability testing is fine (and saves travel expenses). To set up a remote usability test, you need the right software to record video and audio of the test session. Audio is particularly important because you want users to vocalize their thoughts as they interact with your prototype. This will give you further evidence when something is confusing or when users react positively to the design. Introduction. The introduction gives the user context for the test sessions and makes them feel comfortable. Explain that you’re recording the test, and emphasize that you’re not testing the person but the software. There are no wrong actions, and if the user finds mistakes, that’s a good thing. Tasks. Plan three to five tasks for participants to complete during the session. Align tasks with the main goals for the site. If you have specific questions you want to ask during these tasks, write out and include them alongside the tasks. Keep in mind that everyone prepares test plans differently. Usability testing isn’t something you do once then stop. Test each iteration of your design and compare the results to the baseline metrics you established on your first run. Even after your site goes live, don’t stop testing. Usability testing has qualitative aspects like audio and video recordings, but this technique is also your primary source for quantitative data. That’s a good thing—you can compare design iterations to see how one fares versus another. There’s still a bit of observational research, but, for the most part, you’re living in the land of data now. Completion Rate. The percentage of participants who are able to complete a task. If a significant number can’t complete a task, go back to the drawing board. Task Time. This measures how efficiently people are able to complete a task. The quicker the task time, the more intuitive the process. Clicks/perceived effort. Clicks can indicate the complexity of a task. The completion rate may be high, but if it takes a lot of clicks to get there, there’s room for improvement. Depending on the size of your organization, you may outsource part or all of the research and testing process. Identifying the right vendor when so much is at stake—both in initial outlay and later results—is as essential as it is challenging. Nearly all user experience professionals practice some form of human-centered design. This approach includes user research as part of larger, iterative design process. The real difference between seasoned UX designers and newcomers is the sophistication of their process. Experienced designers have a repeatable process they can adapt from project to project; novice designers do things at random. A research-first approach. Research is the lifeblood of successful UX design. If someone can’t articulate their approach, they don’t know how to do it. A portfolio of UX work. A lot of graphic designers claim that they’re comfortable doing experience design when, in fact, they haven’t the slightest idea. Make sure whomever you consider has a strong portfolio of experience design work and can explain that work in detail. A collaborative perspective. UX designers must approach their work with empathy and a sense of collaboration. If a designer is overconfident or doesn’t take an inclusive position, chances are they’re going to push their ideas instead of those gathered from customers. If the process I just described seems involved, that’s because it is. Good UX design is powered by research, so to get the best results, you need to invest in learning about your customers. Remember: You are not your users. Discovery and planning. 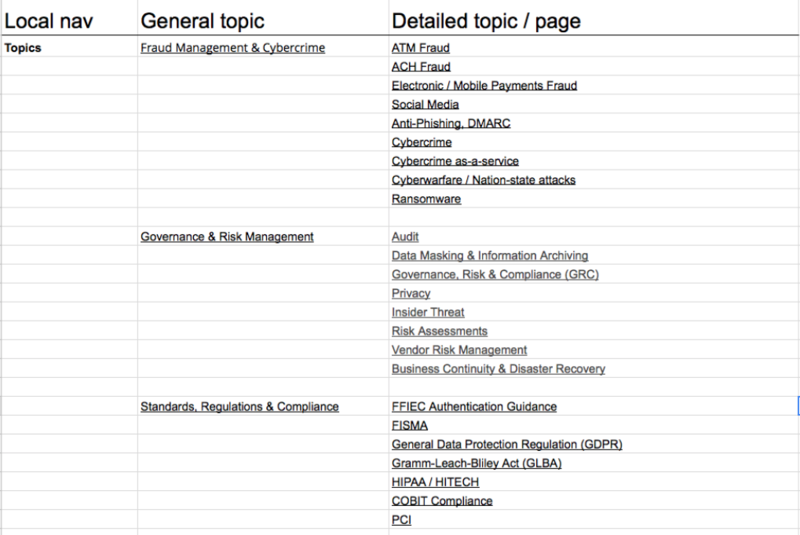 Which issues do internal stakeholders know about? What content currently exists? Which issues does an expert evaluation uncover? Bricklaying. What do our end users think of the site? Who are they and what are their needs? Which tasks do they try to accomplish on our site? Usability testing. How does our research-backed redesign perform? Do users like it? Can they complete tasks more efficiently? Every project is different, so adjust your research to fit its constraints. Just make sure you take a user-centered approach—and do the damn generative research. You’ll be in a prime position to mitigate the risk of a radical redesign and create a website your audience loves.